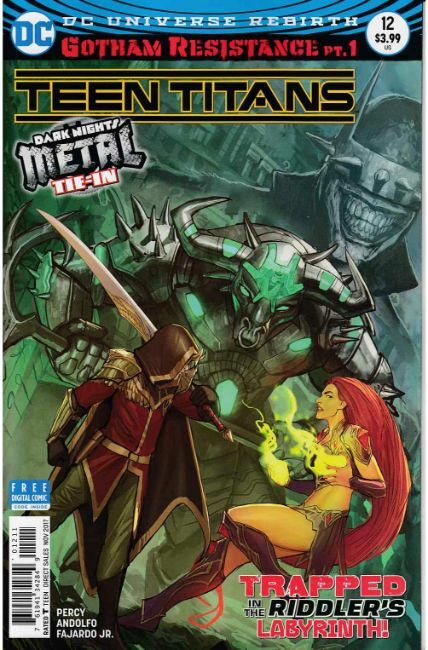 A DARK NIGHTS: METAL tie-in! "GOTHAM RESISTANCE" part one! The fight for Gotham City's soul starts here! When Robin receives a distress call from Nightwing urging him to return home, he discovers that Gotham City has been transformed into a mosaic of monsters, magic and doom! Trapped inside the Riddler's deadly maze with nowhere to turn, Robin soon assembles an unlikely team of hometown heroes including Batgirl, Harley Quinn, Killer Croc, Black Canary and Green Arrow to find the missing Nightwing and save their city!